I planted a multi-stemmed Canada red chokecherry (Prunus virginiana 'Shubert') years ago in my landscaping so I could admire the deep, purplish-red foliage; a signature display of this selection. 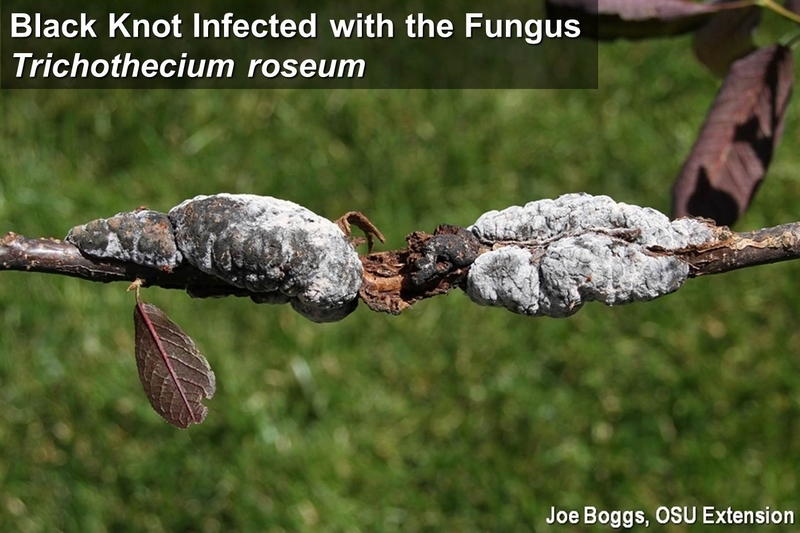 Of course, that was before anyone knew it’s a magnet for the fungus, Apiosporina morbosa; the plant pathogen that causes black knot. The disease is characterized by thick, corky, elongated gall-growths on twigs and branches that become coal-black late in the growing season; thus the common name for the disease. Black knot is now the signature display of many Canada red chokecherry trees. I've managed to stay ahead of black knot ruination by diligently pruning out infected branches during the winter. Thankfully, it's a chokecherry, so my pruning barely keeps ahead of the rampant growth rate of the tree. A few years ago, I noticed some knots becoming pinkish-white to snow white instead of coal-black. I learned the odd coloration was due to a fungal parasite, Trichothecium roseum. I was thrilled! However, I've since learned that although the parasitic fungus may reduce ascospore production by as much as 80%, this is still inadequate to provide an acceptable level of protection. Knots must still be removed; even those infected with Trichothecium roseum. Of course, hope springs eternal. My Canada red is a Monty Python tree, "I'm not dead yet!"